Welcome to part 8 of my Android development tutorial. Today I’m going to show you how to make an android xml parser using the DOM. I’ll cover XmlPullParser next time. The code & video below will help you learn this stuff completely. Here is all of the code in one package Android Stock Quote App. // application and a URL that we will read from. // Used to take advantage of HTTP specific features. // Did we connect properly the the URL? Hello Derek, I want to thank you for your awesome content and support. Im new to this all and want to create a 2d game like jetpack joyride. How long will this take if I spend 6 hours a day learning and trying? Thanks for all the great tutorials. I have been following your tutorials and I must tell you that this is one of the best Android tutorials that I have ever seen. I have learned a lot by listening your tutorials and following the same to create applications. FYI, I have not only bookmarked your site and have also forwarded your links to my friends. Are you are planning to incorporate tutorials based on Sherlock Themes and GUI design? Though, I am a beginner to Android, I am a Sr.Application Developer working on Java and othe technologies for the last 13 years. Your style of intstructions and tutoring has actually taught me to enhance my skills in Android within a shorter time frame. Looking forward to see more advanced tutorials on Android. Once again, thanks for sharing the knowledge with others who are eager to learn. Wishing you the best Derek. Yes I will cover themes and will show how to make much better looking apps in the future. As you can tell, I’m trying to cover as many topics as possible in each tutorial, while trying to avoid getting boring. I really appreciate your videos. I really have nothing specific to ask, but I know how much effort goes into these and I wanted you to know that you’re being viewed and thanked. You’re very welcome 🙂 Thank you for visiting my little site and taking the time to send a nice message. I appreciate it! I cant seem to get it to work, no matter what my methods always return null. Any suggestions on how to implement this? Okay, that didn’t work. Imagine there’s a “” at the end. As you see the data we want is inside the attributes of the tags. 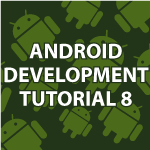 Check out part 9 of my Android Development Tutorial. It may be easier to use XmlPullParser. Thanks for your tutorials. I have been following them recently. android.widget.ScrollView cannot be cast to android.widget.TableLayout. Do you know what might be the cause of this problem? OK. I figured out the problem. stockTableScrollView is the id of a scrollView. Thanks again for your tutorials. Keep going! I’m having this problem to, but I don’t know how to fix it. Maybe the answer is staring me in the face but I’ve been changing values and nothing seems to be working. What am I missing? What errors are you getting in your LogCat panel? Are you using my code? I’ve managed to fix it, using your code and a code compare tool I found online, I tracked it down to having an extra letter on one line of my XML code that was doing me over. It all works now. So how did you solve this? Change the name of the Table Layout under the Scroll View of activity_main.xml, as stockTableScrollView. And give the scroll view some other ID. Hope Derek I am correct. Thanks for the excellent tutorials. I believe your app runs well. But there are several bugs in the source code on the web pages. I suggest you put the whole project file on the web. 2. Sometimes the quote does not contain DaysLow/High. Need to handle it in getTextValue, otherwise the app crashes. I’m sorry you had to repost a bunch of times. I get attacked hundreds of times a day and so I don’t let comments go up without approval. int responseCode = httpConnection.getResponseCode() ? I don’t know much about log cat put from Log.d print outs I have figured out that that is the line where it breaks. If you want more info from logcat, could you tell me how to find it? I understand how to open up logcat, but I don’t know how to find the pertinent info. All I can tell is that it says the error is at doInBackground. Actually, it says “missing internet permission.” As far as I can tell I’ve done exactly what you said to do though. Did you set an internet permission somewhere? I’ve actually now got it all figured out. Hello Derek and thanks for the videos. One question that has been confusing me. The overall package name is “com.newthinktank.stockqutoes”, but then there’s a line in MainActivity that says “public final static String STOCK_SYMBOL = “com.example.myfirstapp.STOCK”. Why are the package names different here? It’s probably something obvious but I’d appreciate if you could tell me! I have this code… it always deletes the top one, and never deletes stuff from savedpreferences… any ideas? Hi Derek, I know it’s not exactly part of the tutorial but do you have any ideas on how to solve this problem? First, fantastic tutorials, I really appreciate you putting forth the effort to make sure a great contribution. I’ve had pretty good success getting thing to work, but got an exception that my StockInfoActivity is not in the manifest. Is that required? Or is there another way to register the activity. Your work is being extremely helpful to me. I am following these tutorials and I have watched 8 of them, understood everything very properly. But in the 8th one, my LogCat says “missing INTERNET permission?” and there are 24 different errors, I have done everything as you have explained, so please help me with this. Thank you very much for the nice compliments. You need to put the following line in your manifest file right after you define the version of android you are using. Thanks for the great tutorials. While following #8, I am having an exception as below. Am I missing something here? The exception is at the time of reading the response code. Needless to say, your tutorials are simply awesome. Thank you 🙂 I’m glad you are enjoying them. There was a bug in Android that was caused when url connections were recycled. Try updating your in Eclipse. Also, try downloading the completed package I provide to make sure there isn’t a typo some place. Since there was no errors in your specific class files in the src folder though, but instead in the SDK I’m guessing the bug I mentioned above is causing the problem. I have looked through multiple forums and tried various solutions, none of which have worked. Any suggestions will be appreciated. 10-14 09:57:48.380: I/Choreographer(861): Skipped 42 frames! The application may be doing too much work on its main thread. 10-14 09:57:49.151: I/Choreographer(861): Skipped 46 frames! The application may be doing too much work on its main thread. I found the error in my manifest file and it worked the first time I ran it but now I am getting the exact same error… I even created a new workspace with your package and still the same. I’m sorry what is the error? thanks a lot for the your videos so far, giving us the chance to learn Android development! to my manifest and it still fails executing the myTask.doInBackground thing.. Trying to debug I always receive the message No source code available. I am sure it somehow needs to be mapped, if so: Which code exactly and how? Most I wonder that the logCat window does not come up with the messages which are written in the catch blocks. The one and only message which I receive is the “Before URL Creation ” in onCreate. Do you have an idea about how to figure out what is going on here? You’re very welcome 🙂 The easiest way to find bugs is to download the complete package for the Android Stock Quote App. Then compare the files in my src directory to yours using a tool like DiffNow. The only other files you may need to look at are the Manifest and the layout files. Derek, I’ve downloaded and ran the completed Stock Quote app from your website, but I still get the “FATAL EXCEPTION” error described above. Does anyone see the same problem? Actually, here’s some additional info about the problem above. When I open your app in Eclipse StockInfoActivity.java shows a lot of errors. I ‘solved’ this problem by changing project.properties file from ‘target=android-17’ to ‘target=android-19’. This enabled me to run the app in the emulator, but it crashes with the ‘FATAL ERROR’ above. So I’m using Android Studio to do these tutorials, and trying to set up rows in the xml design tab seems pretty finicky. It usually defaults to assigning a textview with an android:layout_column. In your tutorial, you don’t use layout_column, but instead use layout_weight. It seems like layout_weight causes a lot less formatting headaches, but is layout_column supposed to be a better formatting option in TableLayouts? I don’t think so. layout_weight is all about the total space available. So if you 1 for one component and 3 for the other they divide the total space 4 so that the second component gets 3/4ths of the space and the other gets 1/4th. layout_column is a sort of measurement that I don’t care for because it seems to be hard to control. great tutorial. Sir, please also cover the wifi direct topics in simple and detailed manner. I have lots of Java experience, and with this tutorial I not only learn you to develop Android apps, but I UNDERSTAND what I am doing and why. The example used to teach is adding an incredible value since it allow to understand each code written linking it to a “meaningful” result. One question: The app works great on my Galaxy Note when holding it vertically, but when I put it horizontally, the row height is much too high. Any idea on how to fix this? Thanks a lot for this incredible tutorials. P.S. : I use Android Studio to develop. Thank you Cedric, I’m happy that you are finding it useful. The reason why you are having the problem when you rotate is because I didn’t create a horizontal layout for the app. I get to how you can do that later in the tutorial. In part 19 of this series I cover it. How can i solve this? I finally finish this tutorial 8! !, First, I want to thank you for sharing some of your experience and knowledge with us. I have a few months trying to learn this and I have found your videos not only really informative but pedagogically sound to understand the concepts. It helps a lot your method of explaining what it does and why , while you are typing the code. I finish this tutorial and I don’t find any red flag on my code however my emulator won’t lunch. I also copy the whole package and try to run it and I got the same response. Should I move on to tutorial 9 or focus on debugging it first? ….emulator fail to lunch.. I tried 3 different emulators. May be my pc is the problem. Is there any labtop minimum requirements that you recommend for developing in eclipse? Hey Derek, just wanted to ask you a question. Do you recommend learning all the commands like DocumentBuilder, Element etc in the MyAsyncTask? No there is no need to memorize. In the beginning you’ll do a lot of copying and pasting from previous code. After a while you’ll remember things naturally. Comment your code very well to help. There seems to be an issue with the Yahoo page. While the initial page (https://developer.yahoo.com/yql/console/?q=show%20tables&env=store://datatables.org/alltableswithkeys#h=select+*+from+yahoo.finance.quote+where+symbol+in+%28%22MSFT%22%29) is reachable from my computer, “THE REST QUERY” page (https://query.yahooapis.com/v1/public/yql?q=select%20*%20from%20yahoo.finance.quote%20where%20symbol%20in%20(%22MSFT%22)&env=store%3A%2F%2Fdatatables.org%2Falltableswithkeys) is not. The same situation with my phone. After some investigation (it’s amazing how many people have this problem), I understood that there could be a problem with my home internet provider filtering somehow the “query.yahooapis.com” domain. Switching my phone connection from home-wireless network to “mobile data”, I was able to reach “THE REST QUERY” page. Thank you again for your great work. I have just finished going through all the tutorials for this project and it appeared that everything was in order. However, when I went to run the app in an emulator the app started and then instantly closed. I have tried two different emulators and the same thing happened. I then downloaded the complete package from this webpage and set it up in Eclipse and attempted to run it. Exactly the same thing happened as before. Is there anything I can do about this? Sorry about the problems. I’m guessing that Yahoo changed their tags and that is the issue. Just in the past few weeks I have been getting complaints. I’ll be doing a new Android tutorials starting this month. This time I’ll try not to use anything that could possibly break. App runs perfectly well, made some mistakes, but as you suggested above to use DiffNow tool was able to grab it. When I press print, it prints the whole website out. Is there a way to only print the code? Hi Jeff, Put your mouse over the top right edge of the code and then either click the View Source or print icons that show. Nice video tutorial. I had learn a lot from videos till now. Will complete the whole tutorial soon. I test the app in your tutorial on my Nexus 7 and not on the emulator as it’s very slow. I got two errors while testing the app. II) You cannot enter a wrong symbol as it gives error after pressing the Quote button that this app have been stopped. Can you please fix them. In the first error can you also tell how to fix the app to run only on vertical mode. Sorry about the errors. I should have stated that the apps weren’t optimized, but instead were structured more to cover as much as possible. I’m making a new Android tutorial that will fix those issues in the next few weeks. I just finished with this tutorial. I ran the program, and while it’s not catching any errors, all of the stock information returns empty when I hit the quote button. Everything else seems to be working fine, including the web button. I’ve been going my code and comparing it to yours, but I can’t seem to find what’s wrong. Do you have any ideas as to what’s causing this? I think the feed at Yahoo has changed. To make it work you’ll just need to update to the new tags on Yahoo. Sorry about that. Next time I’ll use my own web service. Yeah, I just worked it out and they did change it. Thanks for the help, and keep up the good work! I’ve done all the things as you have shown in this tutorial and previous but the app didn’t work. I executed the program into my android device, the app started but when i enetred the symbol of a company i.e msft and aapl and hit enter nothing happened. Plz help me solve this problem. Try downloading the package I provide and tell me if that doesn’t work. Yahoo may have changed their tags. First of all thank u again for a wonderful tutorial! I have a problem, after I press the ‘Quote’ button the app crashes. and changed the ‘src’ folder and all its content to be same as your code, as well as the ‘AndroidManifest.xml’, but it still crashes! can u please help me solve the problem? Btw the ‘Web’ button works perfectly. Sorry about that. I think Yahoo randomly changes their feed. You can fix it by going in and changing based on their new feed. I’ll eliminate this issue by showing how to build your own web services very soon. Derek, thanks so much for these awesome tutorials ! Awesome learning experience for me thanks to you!! Could you tell if you are planning to do tutorials on headless web scrapping in java?